DIE Lunæ, videlicet, 20 die Junii. Ld. M'Gwire, Macmahown, and Col. Read, committed to The Tower. Judges of the King's Bench to examine them there. Earl of Salisbury will at tend the House. Order to send for him as a Delinquent vacated. and with a Vote that all who act under the Commission of Array are Disturbers of the Peace. Lord Mayor, &c. will attend the Committees at a Common Hall this Afternoon. Geo. Benyon committed to Colchester Gaol. 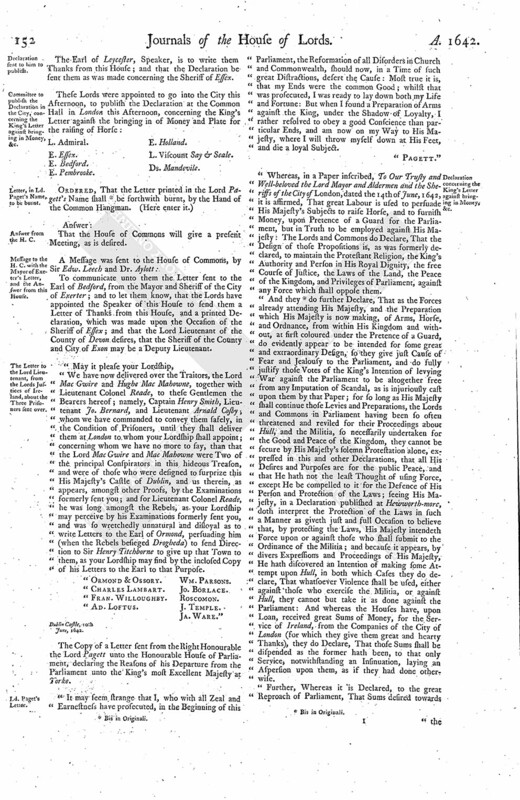 Commission of Array for Leicestershire to E. Huntingdon, and the Vote upon it, to be printed. and with an order for Ten Thousand Pounds to be paid by the Chamberlain of London. Declaration for the Sheriffs not to publish the Proclamation against the Militia, to be examined, &c. Judgement in Ld. St. John's Cause. Message to the H. C. for a Conference about the Three Prisoners from Ireland. Conference about Letters from the Prince of Orange reported. English Commissioners to communicate One directed to both Parliaments to the Scots Commissioners. Mayor of Exeter, about the Proclamation against the Militia. Declaration sent to him to publish. 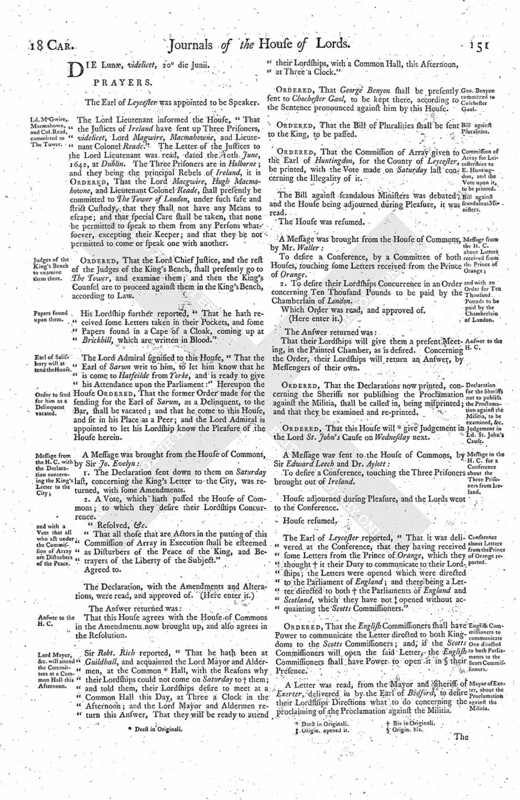 Committee to publish the Declaration in the City, concerning the King's Letter against bringing in Money, &c.
Letter, in Ld. Paget's Name, to be burnt. Message to the H. C. with the Mayor of Exeter's Letter, and the Answer from this House. The Letter to the Lord Lieutenant, from the Lords Justices of Ireland, about the Three Prisoners sent over. Declaration concerning the King's Letter against bringing in Money, &c.
Order for the Chamberlain of London to pay Ten Thousand Pounds to the Treasurer of the Irish Adventure. The Earl of Leycester was appointed to be Speaker. The Lord Lieutenant informed the House, "That the Justices of Ireland have sent up Three Prisoners, videlicet, Lord Magwire, Macmahowne, and Lieutenant Colonel Reade." The Letter of the Justices to the Lord Lieutenant was read, dated the 10th June, 1642, at Dublin. The Three Prisoners are in Holborne; and they being the principal Rebels of Ireland, it is Ordered, That the Lord Macgwire, Hugh Macmahowne, and Lieutenant Colonel Reade, shall presently be committed to The Tower of London, under such safe and strict Custody, that they shall not have any Means to escape; and that special Care shall be taken, that none be permitted to speak to them from any Persons whatsoever, excepting their Keeper; and that they be not permitted to come or speak one with another. Ordered, That the Lord Chief Justice, and the rest of the Judges of the King's Bench, shall presently go to The Tower, and examine them; and then the King's Counsel are to proceed against them in the King's Bench, according to Law. His Lordship further reported, "That he hath received some Letters taken in their Pockets, and some Papers found in a Cape of a Cloak, coming up at Brickhill, which are written in Blood." The Lord Admiral signified to this House, "That the Earl of Sarum writ to him, to let him know that he is come to Hatfeilde from Yorke, and is ready to give his Attendance upon the Parliament:" Hereupon the House Ordered, That the former Order made for the sending for the Earl of Sarum, as a Delinquent, to the Bar, shall be vacated; and that he come to this House, and sit in his Place as a Peer; and the Lord Admiral is appointed to let his Lordship know the Pleasure of the House herein. 1. The Declaration sent down to them on Saturday last, concerning the King's Letter to the City, was returned, with some Amendments. 2. A Vote, which hath passed the House of Commons; to which they desire their Lordships Concurrence. "That all those that are Actors in the putting of this Commission of Array in Execution shall be esteemed as Disturbers of the Peace of the King, and Betrayers of the Liberty of the Subject." That this House agrees with the House of Commons in the Amendments now brought up, and also agrees in the Resolution. Sir Robt. Rich reported, "That he hath been at Guildhall, and acquainted the Lord Mayor and Aldermen, at the Common (fn. 1) Hall, with the Reasons why their Lordships could not come on Saturday to † them; and told them, their Lordships desire to meet at a Common Hall this Day, at Three a Clock in the Afternoon; and the Lord Mayor and Aldermen return this Answer, That they will be ready to attend their Lordships, with a Common Hall, this Afternoon, at Three a Clock." Ordered, That George Benyon shall be presently sent to Chochester Gaol, to be kept there, according to the Sentence pronounced against him by this House. Ordered, That the Bill of Pluralities shall be sent to the King, to be passed. Ordered, That the Commission of Array given to the Earl of Huntingdon, for the County of Leycester, be printed, with the Vote made on Saturday last concerning the Illegality of it. The Bill against scandalous Ministers was debated and the House being adjourned during Pleasure, it was read. To desire a Conference, by a Committee of both Houses, touching some Letters received from the Prince of Orange. 2. To desire their Lordships Concurrence in an Order concerning Ten Thousand Pounds to be paid by the Chamberlain of London. Which Order was read, and approved of. That their Lordships will give them a present Meeting, in the Painted Chamber, as is desired. Concerning the Order, their Lordships will return an Answer, by Messengers of their own. Ordered, That the Declarations now printed, concerning the Sheriffs not publishing the Proclamation against the Militia, shall be called in, being misprinted; and that they be examined and re-printed. Ordered, That this House will (fn. 2) give Judgement in the Lord St. John's Cause on Wednesday next. To desire a Conference, touching the Three Prisoners brought out of Ireland. The Earl of Leycester reported, "That it was delivered at the Conference, that they having received some Letters from the Prince of Orange, which they thought (fn. 3) it their Duty to communicate to their Lordships; the Letters were opened which were directed to the Parliament of England; and there being a Letter directed to both (fn. 3) the Parliaments of England and Scotland, which they have not (fn. 4) opened without acquainting the Scotts Commissioners." Ordered, That the English Commissioners shall have Power to communicate the Letter directed to both Kingdoms to the Scotts Commissioners; and, if the Scotts Commissioners will open the said Letter, the English Commissioners shall have Power to open it in (fn. 5) their Presence. A Letter was read, from the Mayor and Sheriff of Exerter, delivered in by the Earl of Bedford, to desire their Lordships Directions what to do concerning the proclaiming of the Proclamation against the Militia. The Earl of Leycester, Speaker, is to write them Thanks from this House; and that the Declaration be sent them as was made concerning the Sheriff of Essex. To communicate unto them the Letter sent to the Earl of Bedford, from the Mayor and Sheriff of the City of Exerter; and to let them know, that the Lords have appointed the Speaker of this House to send them a Letter of Thanks from this House, and a printed Declaration, which was made upon the Occasion of the Sheriff of Essex; and that the Lord Lieutenant of the County of Devon desires, that the Sheriff of the County and City of Exon may be a Deputy Lieutenant. "We have now delivered over the Traitors, the Lord Mac Gwire and Hughe Mac Mahowne, together with Lieutenant Colonel Reade, to these Gentlemen the Bearers hereof; namely, Captain Henry Smith, Lieutenant Jo. Bernard, and Lieutenant Arnald Cosby; whom we have commanded to convey them safely, in the Condition of Prisoners, until they shall deliver them at London to whom your Lordship shall appoint; concerning whom we have no more to say, than that the Lord Mac Gwire and Mac Mahowne were Two of the principal Conspirators in this hideous Treason, and were of those who were designed to surprize this His Majesty's Castle of Dublin, and us therein, as appears, amongst other Proofs, by the Examinations formerly sent you; and for Lieutenant Colonel Reade, he was long amongst the Rebels, as your Lordship may perceive by his Examinations formerly sent you, and was so wretchedly unnatural and disloyal as to write Letters to the Earl of Ormond, persuading him (when the Rebels besieged Drogheda) to send Direction to Sir Henry Titchborne to give up that Town to them, as your Lordship may find by the inclosed Copy of his Letters to the Earl to that Purpose. Dublin Castle, 10th June, 1642. The Copy of a Letter sent from the Right Honourable the Lord Pagett unto the Honourable House of Parliament, declaring the Reasons of his Departure from the Parliament unto the King's most Excellent Majesty at Yorke. "It may seem strange that I, who with all Zeal and Earnestness have prosecuted, in the Beginning of this Parliament, the Reformation of all Disorders in Church and Commonwealth, should now, in a Time of such great Distractions, desert the Cause: Most true it is, that my Ends were the common Good; whilst that was prosecuted, I was ready to lay down both my Life and Fortune: But when I found a Preparation of Arms against the King, under the Shadow of Loyalty, I rather resolved to obey a good Conscience than particular Ends, and am now on my Way to His Majesty, where I will throw myself down at His Feet, and die a loyal Subject. "Whereas, in a Paper inscribed, To Our Trusty and Well-beloved the Lord Mayor and Aldermen and the Sheriffs of the City of London, dated the 14th of June, 1642, it is affirmed, That great Labour is used to persuade His Majesty's Subjects to raise Horse, and to furnish Money, upon Pretence of a Guard for the Parliament, but in Truth to be employed against His Majesty: The Lords and Commons do Declare, That the Design of those Propositions is, as was formerly declared, to maintain the Protestant Religion, the King's Authority and Person in His Royal Dignity, the free Course of Justice, the Laws of the Land, the Peace of the Kingdom, and Privileges of Parliament, against any Force which shall oppose them. "And they (fn. 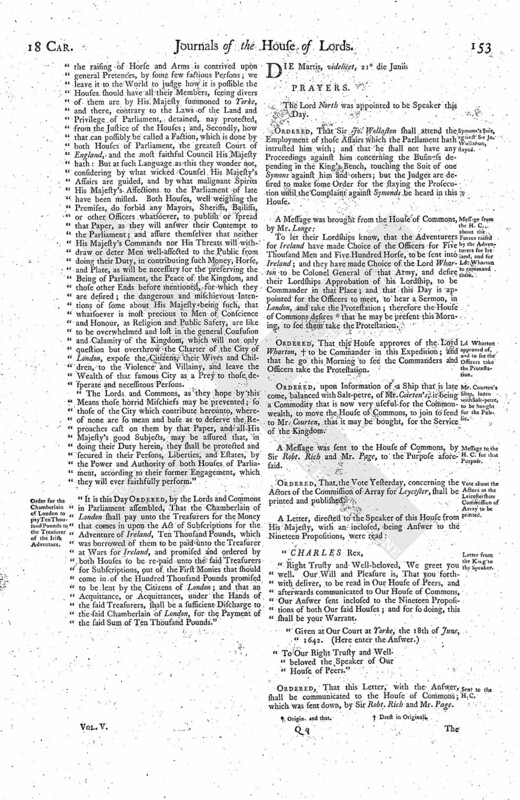 7) do further Declare, That as the Forces already attending His Majesty, and the Preparation which His Majesty is now making, of Arms, Horse, and Ordnance, from within His Kingdom and without, at first coloured under the Pretence of a Guard, do evidently appear to be intended for some great and extraordinary Design, so they give just Cause of Fear and Jealousy to the Parliament, and do fully justify those Votes of the King's Intention of levying War against the Parliament to be altogether free from any Imputation of Scandal, as is injuriously cast upon them by that Paper; for so long as His Majesty shall continue those Levies and Preparations, the Lords and Commons in Parliament having been so often threatened and reviled for their Proceedings about Hull, and the Militia, so necessarily undertaken for the Good and Peace of the Kingdom, they cannot be secure by His Majesty's solemn Protestation alone, expressed in this and other Declarations, that all His Desires and Purposes are for the public Peace, and that He hath not the least Thought of using Force, except He be compelled to it for the Defence of His Person and Protection of the Laws; seeing His Majesty, in a Declaration published at Hewworth-morc, doth interpret the Protection of the Laws in such a Manner as giveth just and full Occasion to believe that, by protecting the Laws, His Majesty intendeth Force upon or against those who shall submit to the Ordinance of the Militia; and because it appears, by divers Expressions and Proceedings of His Majesty, He hath discovered an Intention of making some Attempt upon Hull, in both which Cases they do declare, That whatsoever Violence shall be used, either against those who exercise the Militia, or against Hull, they cannot but take it as done against the Parliament: And whereas the Houses have, upon Loan, received great Sums of Money, for the Service of Ireland, from the Companies of the City of London (for which they give them great and hearty Thanks), they do Declare, That those Sums shall be dispended as the former hath been, to that only Service, notwithstanding an Insinuation, laying an Aspersion upon them, as if they had done otherwise. "Further, Whereas it is Declared, to the great Reproach of Parliament, That Sums desired towards the raising of Horse and Arms is contrived upon general Pretences, by some few factious Persons; we leave it to the World to judge how it is possible the Houses should have all their Members, seeing divers of them are by His Majesty summoned to Yorke, and there, contrary to the Laws of the Land and Privilege of Parliament, detained, nay protected, from the Justice of the Houses; and, Secondly, how that can possibly be called a Faction, which is done by both Houses of Parliament, the greatest Court of England, and the most faithful Council His Majesty hath: But at such Language as this they wonder not, considering by what wicked Counsel His Majesty's Affairs are guided, and by what malignant Spirits His Majesty's Affections to the Parliament of late have been misled. Both Houses, well weighing the Premises, do forbid any Mayors, Sheriffs, Bailiffs, or other Officers whatsoever, to publish or spread that Paper, as they will answer their Contempt to the Parliament; and assure themselves that neither His Majesty's Commands nor His Threats will withdraw or deter Men well-affected to the Public from doing their Duty, in contributing such Money, Horse, and Plate, as will be necessary for the preserving the Being of Parliament, the Peace of the Kingdom, and those other Ends before mentioned, for which they are desired; the dangerous and mischievous Intentions of some about His Majesty being such, that whatsoever is most precious to Men of Conscience and Honour, as Religion and Public Safety, are like to be overwhelmed and lost in the general Consusion and Calamity of the Kingdom, which will not only question but overthrow the Charter of the City of London, expose the Citizens, their Wives and Children, to the Violence and Villainy, and leave the Wealth of that famous City as a Prey to those desperate and necessitous Persons. "The Lords and Commons, as they hope by this Means those horrid Mischiefs may be prevented; so those of the City which contribute hereunto, whereof none are so mean and base as to deserve the Reproaches cast on them by that Paper, and all His Majesty's good Subjects, may be assured that, in doing their Duty herein, they shall be protected and secured in their Persons, Liberties, and Estates, by the Power and Authority of both Houses of Parliament, according to their former Engagement, which they will ever faithfully perform." "It is this Day Ordered, by the Lords and Commons in Parliament assembled, That the Chamberlain of London shall pay unto the Treasurers for the Money that comes in upon the Act of Subscriptions for the Adventure of Ireland, Ten Thousand Pounds, which was borrowed of them to be paid unto the Treasurer at Wars for Ireland, and promised and ordered by both Houses to be re-paid unto the said Treasurers for Subscriptions, out of the First Monies that should come in of the Hundred Thousand Pounds promised to be lent by the Citizens of London; and that an Acquittance, or Acquittances, under the Hands of the said Treasurers, shall be a sufficient Discharge to the said Chamberlain of London, for the Payment of the said Sum of Ten Thousand Pounds."